Our factory is located in the Zhangjiagang City with convenient transportation, one and half hour drive from Shanghai. We are committed to improving the standard of our products to fulfill the growing various solution for bottle packaging and beverage industry over the past few years. 1. Bottled water filling line which can produce mineral or pure water both in bottled or barrel packed. There are DCGF bottled water filling production line for 200ml-2500ml and TXG barrel water filling line for 3~5 gallon.Those lines are suitable for producing bottled drinking water for you. 2. The RCGF series juice production line which can produce bottled drinking beverage like apple, sour cherry, pomegranate and orange grape, pineapple, tomato, mango and blends etc. This line is suitable for PET bottled juice within the volume from 200ml to 2500ml. 3. The carbonated drink production line is used to produce carbonated drink or spark drink and other soft drink with the capacity from 200ml to 2500ml and with production capacity varies from 6000-30000B/H. (1). Simple transmission: the machine adopts integral bed-plate, good rigidity structure and easy to clean. Bottle conveying by hang bottle neck, drive space is large, The machine is easy to maintenance with lubricating system. (2). Washing parts: spring type clamps are placed the bottleneck to invert the bottle at 180°. Ensure the bottle are clean. (3). 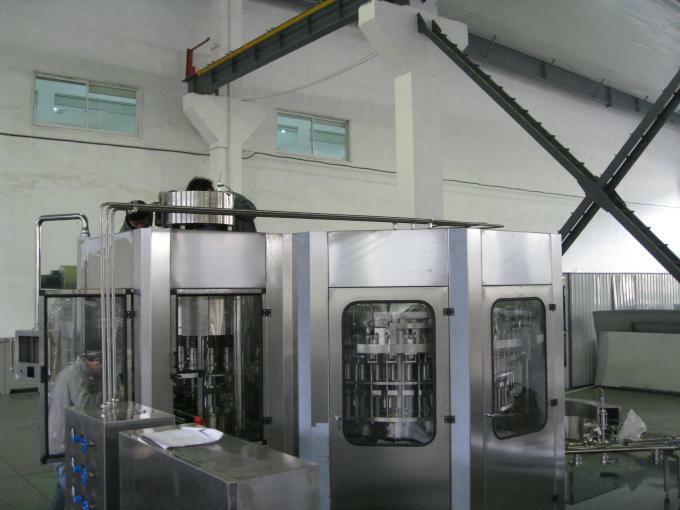 Precise bottle centering in filling process: hang bottle neck feeding bottle form and centering cover make the bottleneck and filling valve seal and accurate. (4). Precise liquid level controller: liquid tank equip probe-type liquid level meter. Through the variable signal, The machine control the feed liquor automatically, ensure the liquid level of the tank unchanged in filling process. (5). Precise speed regulation: advanced motor frequency modulation technology to ensure the speed regulation accurate and smoothly in machine start-up and production. The machine controlled by PLC and digital display filling speed. (6). Health structure: all the parts connected with beverage adopt SUS304, all the liquid piping and air piping adopt Tube Polishing, all the seal ring with beverage adopt food grade nitrile rubber or silicon rubber. (7). Advanced capping structure: Magnetic torque is used for screw capping, the power of screw capping can be adjustable, it is suitable for various types of plastic cap. The machine adopts tooth form to choice the caps. Feeding runway of caps equip detection device, ensure no bottle no cap, no reverse cap. (8). Easy to change the bottle: all the spare parts adopts quick open structure, it is suitable for various sizes of bottle.